There is a little gathering/bunching at the armholes in back. The muslin was a bit too tight across the chest in front – more ease there was needed. 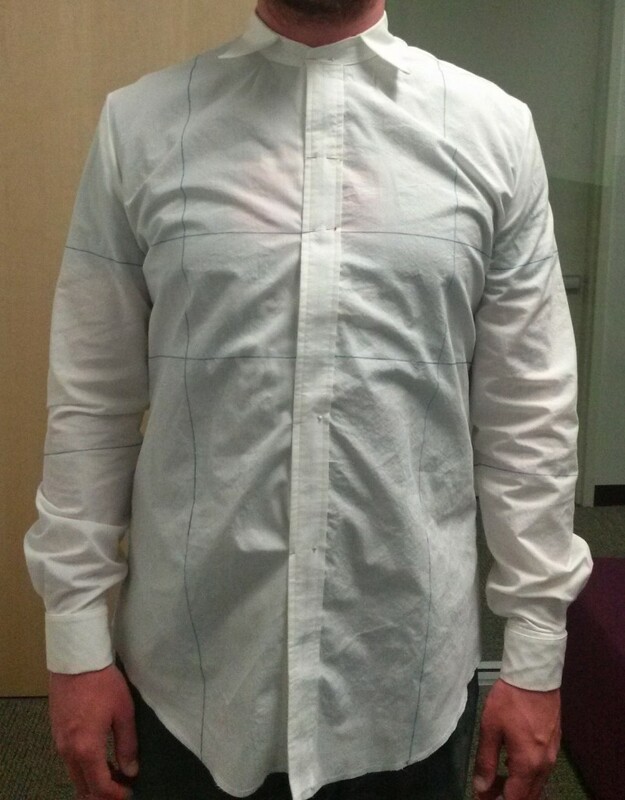 The front/back balance of the shirt was slightly off – the balance lines were lower in back. 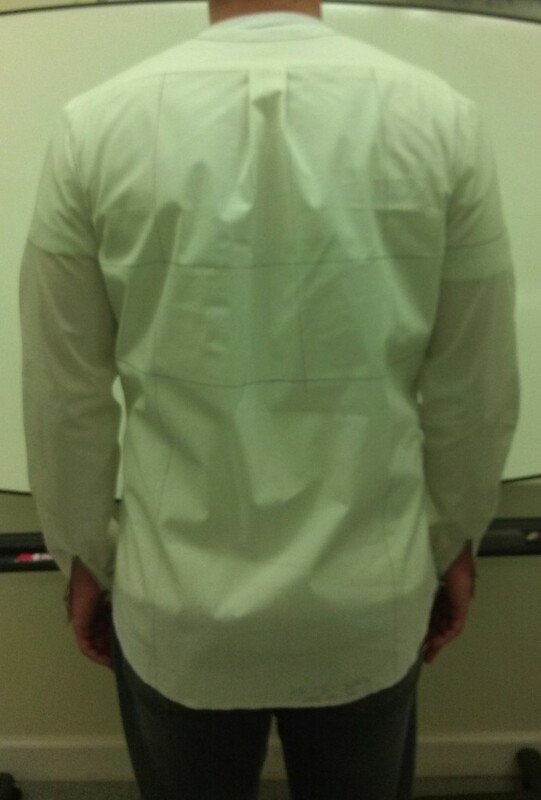 Taking a tuck across the shoulder blades improved the way the shirt hung in back. 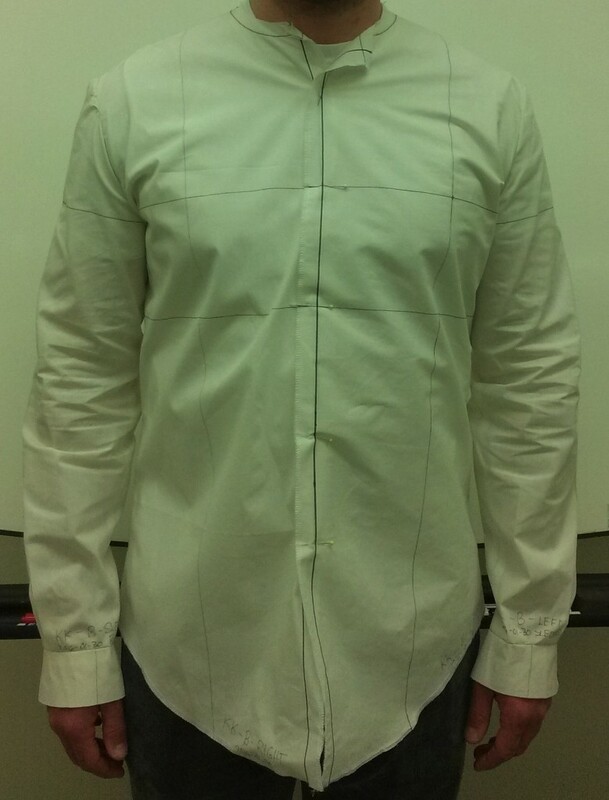 In the pattern adjustments, I added 1 inch of ease at the center front, effectively adding 2 inches of ease to the front of the shirt. On the client, I used a marker to trace out where his natural armscye fell, and updated the armscye curves to match. 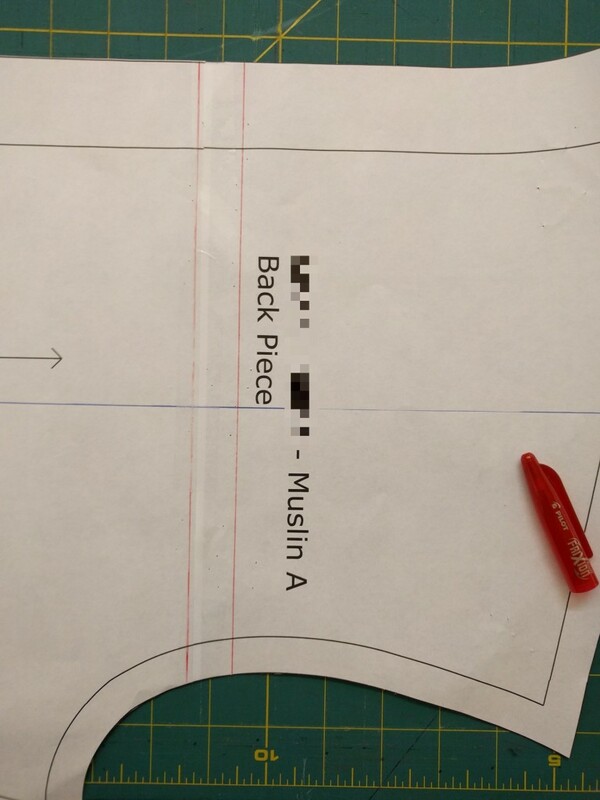 I also took a 3/4″ tuck out of the back pattern piece, across the shoulders. The red lines show where I took the tuck. I made a pattern editing mistake here, which I’ll discuss shortly. I placed around the client’s neck a paper cylinder made from a file folder, as a way of figuring out what the neck circumference should be. And I also took the client’s measurements. From those, I drafted a new sleeve and cuff pattern, using drafting instructions I learned from Paul Gallo during his class on pattern making and draping at the Sips N’ Sews Studio during the month of January. 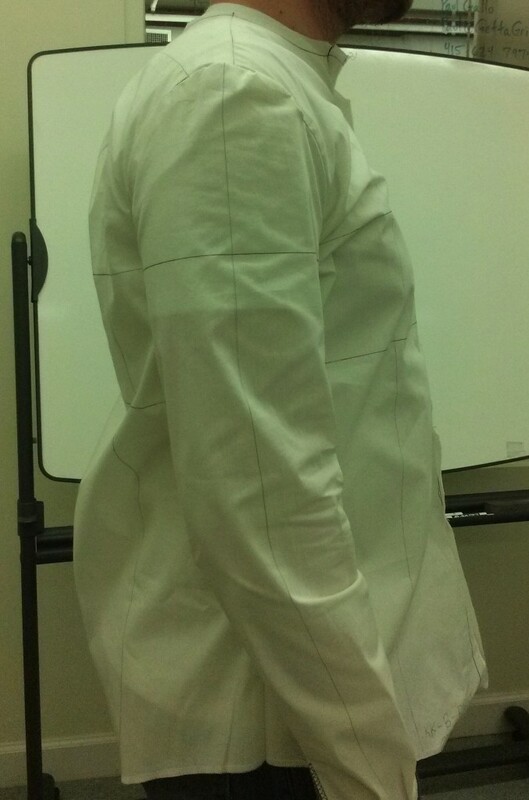 If you are curious, Gallo demonstrates this sleeve draft in his Craftsy class Fashion Draping: Dressmaking Basics. 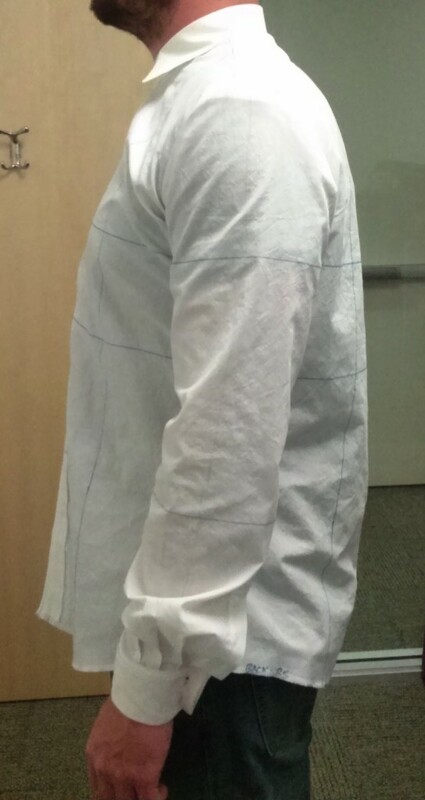 After the first fitting, I thought I would need one, maybe two more fitting sessions to get a good pattern. 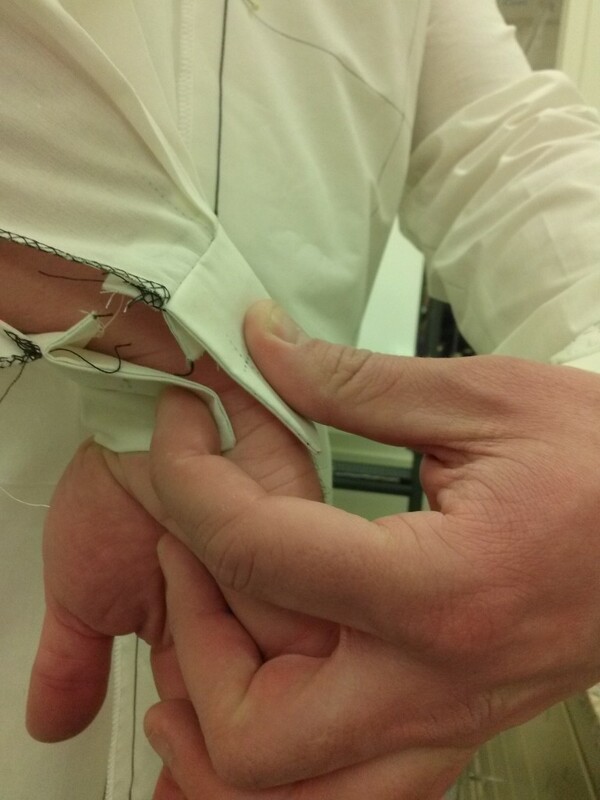 The second fitting didn’t go as planned. It was a step backwards from the first. Additionally, some tightness and pulling developed in the underarm area which I saw but didn’t quite understand. You can see it in the side view here. I added some fabric to the muslin at the neckline, then with the garment on the client I marked out a new neckline with a Sharpie, as Paul Gallo demonstrated in class. I also remeasured the bicep, elbow and wrist. 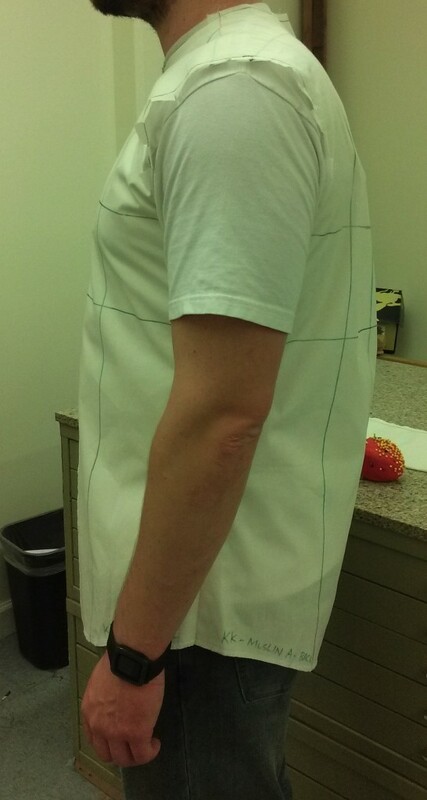 These measurements were off, and contributed to the too-tight sleeve. And I mocked out a new cuff in muslin, to make sure it fit the client. At this fitting I was still confident I could get the remaining issues resolved, and then move on to making the final shirt. With the wedding a month away, I was giving up the idea of producing a wearable muslin. Things continued to look good in back. The front still showed some pulling at the underarms and a bit of tightness across the chest. The side view shows the underarm pulls even better. I was amazed to discover issues remained with the collar and cuffs. The good news is that the collar, with a neckline drawn to fit the client, hugged the back of the client’s neck in just the right way. The bad news was that collar and cuffs were still a bit too tight. The sleeve looks nice in the photos. With an additional inch of ease around the bicep, the sleeve fit the client better and he was happier with it. But the sleeve still had major mobility problems. Front reach (as if you were reaching forward to grab a steering wheel) and back reach (drawing arms back as if rowing a boat) both caused the shirt to pull. When the arms drawn back, the front band of the shirt strained at the points where it was pinned. 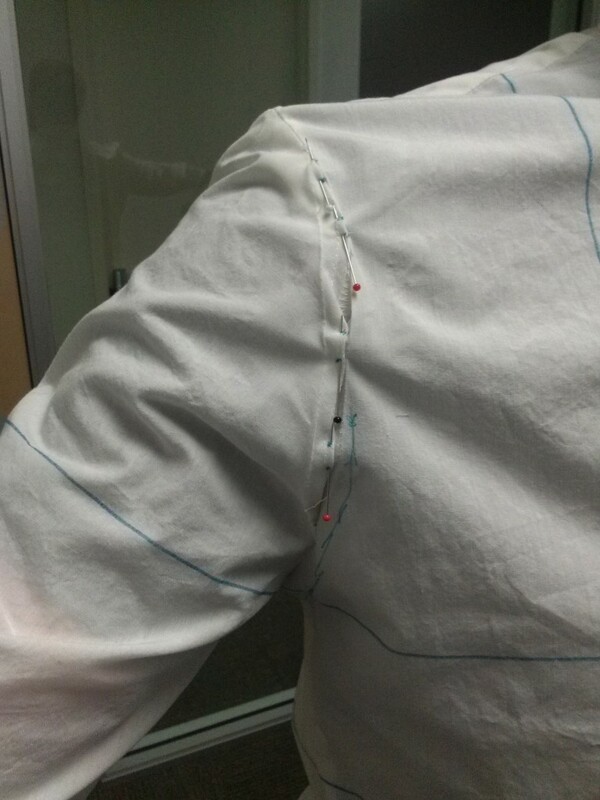 With the shirt on the client, I ripped open the armscye seam with a seam ripper and pinned a new seam, letting out the 5/8 seam allowance to provide more ease in that area. I did this on one side only and let the client compare it to the unadjusted sleeve. This definitely helped with front/back mobility, but an issue remained: when the client raised his arms, the sides of the shirt pulled out from the waist. For the pattern adjustments leading to the next fitting, I added from front to back on the sleeve cap. 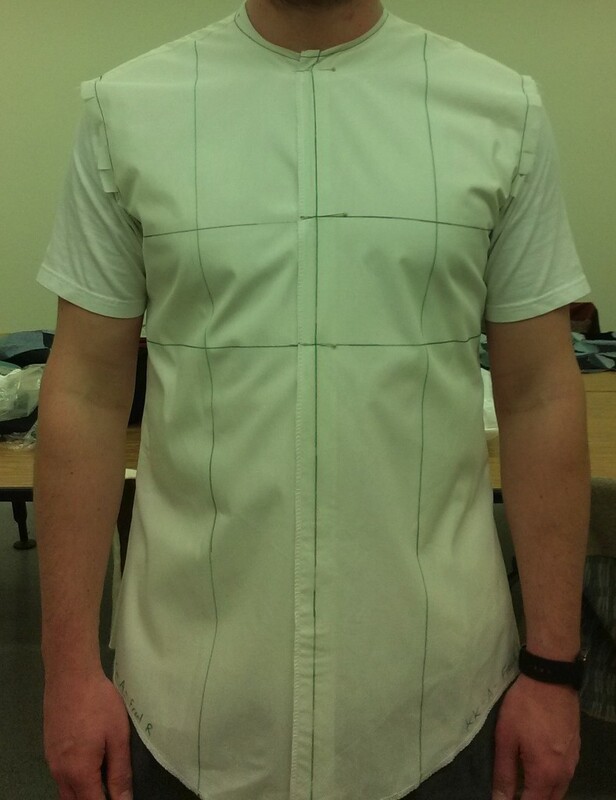 This screenshot from Wild Ginger’s Pattern Editor shows how the sleeve cap evolved to provide greater front/back mobility. The blue curve shows the sleeve as I had drafted it, with Paul Gallo’s instructions. The green curve shows the curve that I got from splitting the seams and letting out the seam allowances. 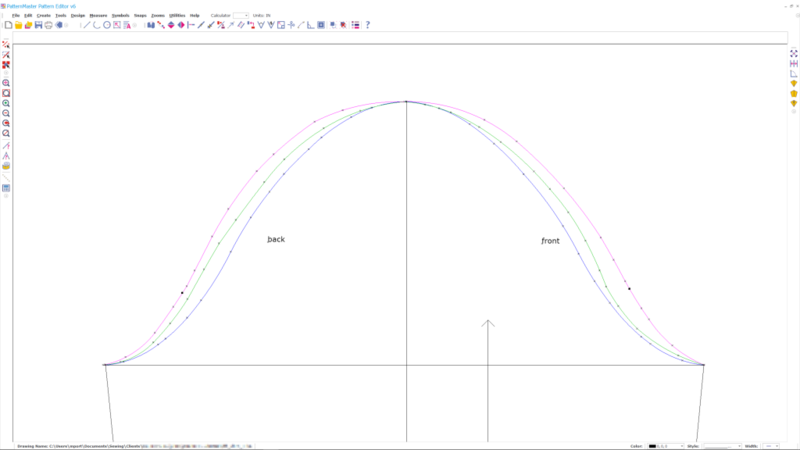 The purple curve is the curve that I went with, for the fourth fitting. On the computer, I learned that I could let out that curve even more, while impacting the length of the curve (which affects how the sleeve sets into the armscye) minimally, so I chose to let that seam out even more to give the client more room. At this point, confidence was starting to give way to despair. The fitting issues still hadn’t been resolved, and at three weeks remaining, time was growing short. The issues with mobility from front/back on the sleeve were resolved on this fitting. 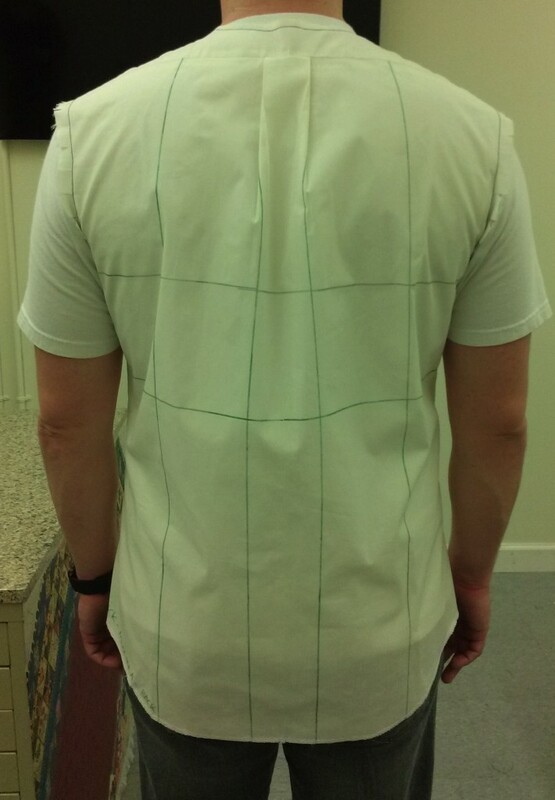 But up/down mobility remained a problem; when the client raised his arms, the side of the shirt still pulled up. I recounted earlier how I found a Pinterest diagram that explained the issue and the correction to be made. This Wild Ginger screenshot shows what I did to add increased freedom of movement when the client raised their arms. 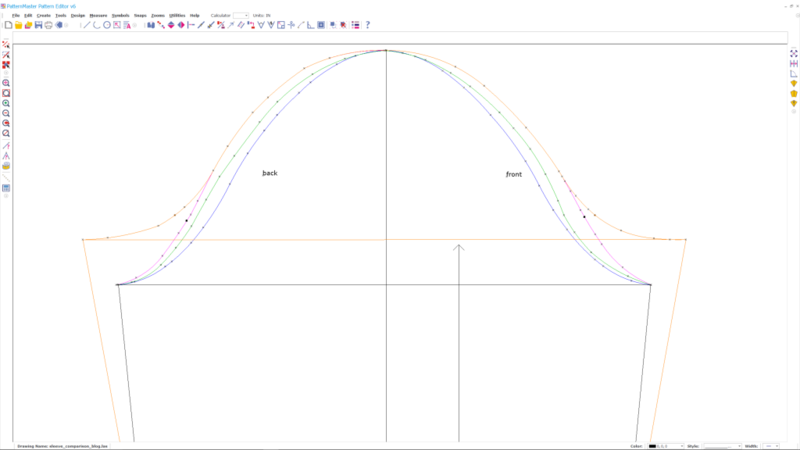 The new sleeve curve is in orange. The alteration lengthens the inside sleeve seam. Because I had also enlarged the armscye (see below), I also widened the sleeve cap to match the armscye. This also provides additional width around the bicep. Finally, the alteration raises the bicep line (horizontal line), effectively lowering the sleeve cap height. And I was still having problems getting the collar to fit appropriately. The collar especially irked me, because I was making careful adjustments to the pattern that didn’t pan out when sewed into a muslin and tested on the client. So I actually measured the finished collar stand against the pattern – and that’s when I discovered why I could never get the collar to fit properly. The muslin fabric shrank substantially when I constructed the collar stand. The heat and pressing from the iron is responsible for the shrinkage. The completed collar stand measured fully an inch shorter than the pattern; similarly, the completed cuffs measured about a half-inch shorter in circumference. Around this time, I had a discussion with Tammy at Sips N’ Sews about my collar and sleeve fit issues. She was very helpful in leading a discussion to help me find the resolution for my problems. I went back and studied the pattern some more. I compared the front and back pattern pieces, against each other and with the original trace I took from the RTW garment. And I discovered front and back did not meet at the armscye. 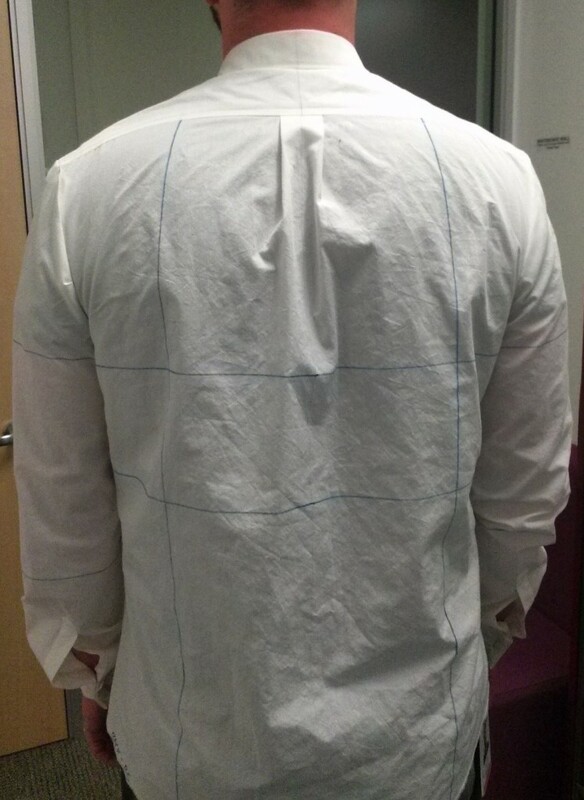 The back pattern piece ended an inch higher than in the front. This imbalance contributed to several problems I was seeing but chose not to see: the strain lines at front, and the source of the client’s complaints about tightness in the underarm area. The ultimate cause of the front/back discrepancy can trace all the way back to the first fitting session, when I took out a tuck to improve the balance. I didn’t update the back armscye to match the front, and this problem persisted through several fittings. Between the fabric shrinkage wreaking havoc with collar and cuff measurements, and the pattern drafting error affecting the armscye, I had been chasing my tail through three rounds of fittings. And time was running out. It was easy to fix the back armscye curve by dropping it an inch to match the front. On the sleeve I made the freedom-of-movement changes I described above. And I made a collar sample to test on the client, in order to get the actual size once and for all. I went ahead and sewed together what I thought was the final garment, basting in the sleeves as an insurance in case they still needed adjustment. This fitting, just a week before the wedding, was sewed in fashion fabric. I’ve already recounted the details in my “Make it work moment” blog post. I had finally resolved the sleeve and collar fit issues to mine and the client’s satisfaction. 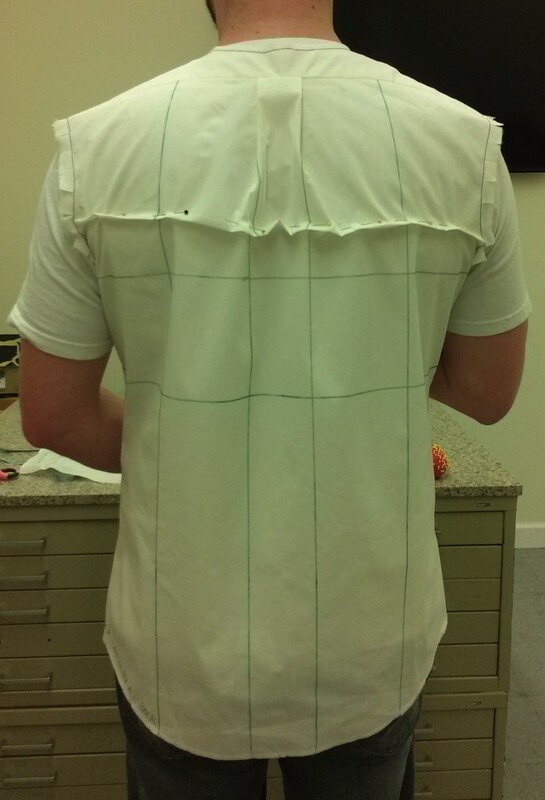 As well, fixing the armscye curve improved the fit and ended the client’s distress with binding at the underarm area. But the fabric turned out to be too stiff and crinkly. So I made one more shirt, the final shirt which made its appearance at the wedding. Following the mantra “perfect is the enemy of good” I chose only to lengthen the shirttails by an inch so the shirt would better tuck into the tuxedo trousers. So, one lesson is to pre-shrink the muslin before making up the test garment to avoid unpredictable shrinkage from the construction pressing. I hadn’t thought of that. I didn’t mention it in the article, but Paul Gallo says muslin fabric should only be pressed with a hot dry iron, no steam. I’ve learned that typically you don’t pre-wash muslin, though I did that for one of the test fittings and even then it still shrunk after pre-washing. I would say to be safe you should always do a test iron on a scrap of fabric. I did that with a 20-inch long strip of muslin (forget whether it was lengthwise or crosswise grain) and saw 1/2 inch of shrinkage when pressed with the iron. Admittedly I am a “rule breaker”, but I steam press my muslin like crazy BEFORE I cut a pattern from it. This way, it takes out the shrinkage and still retains it’s crisp hand. Your photo journalism and commentary of the process is wonderful!! Catina, thanks for the compliments. Even with a hot dry iron, I could see the unwashed muslin distorting a bit where I pressed, so I should have suspected something. I think your steam pressing idea makes a lot of sense! Pre-washing does remove the crispness of the fabric for sure. You’re my fitting hero! I don’t know how you persevere through it. I’m on my second muslin of a blazer, and ready to chuck the whole project. I’m going to try your sharpie grid approach next. It may give me some clue as to where things are going astray. The sharpie grid comes from Sarah Veblen, though I think other readers have pointed out it is used by professionals. It does really help you see if one ore more areas of the garment isn’t hanging on grain. Just a quick note about men’s shirt sleeves. Remember this is a man’s shirt, not a woman’s blouse. Men’s shirt sleeves are not fitted (ok, if you are costuming a show, do as much fitting as the director wants, but not on casual or formal shirts), therefore trying to remove all those seemingly ill-fitting folds is not productive to good movement. 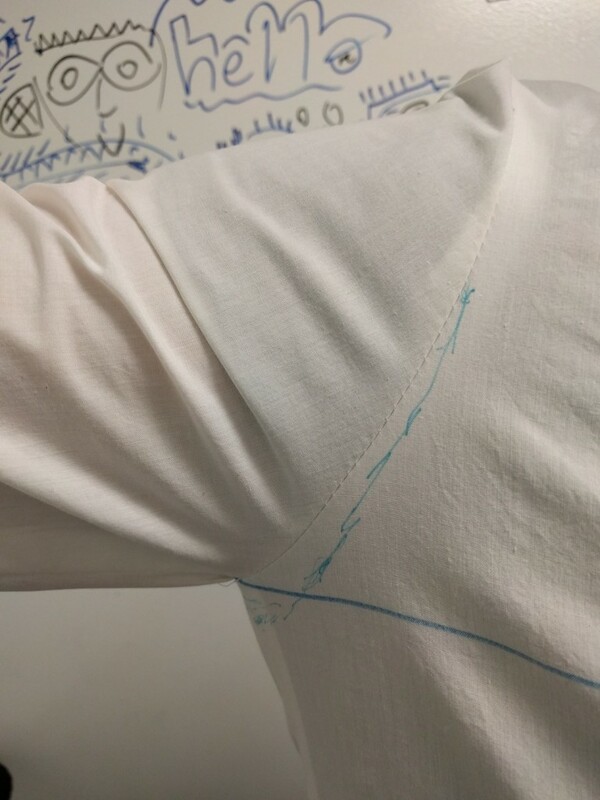 Notice that in the end, you lowered your sleeve cap, and increased the biceps width, essentially creating a gusset-like effect at the sleeve underseam/cap intersection. This creates nice movement both front and back and for raising the arms, but at the relaxed state, there will be extra fabric at the armpits. That is ok! Men’s woven casual and formal shirts are not fitted, ease at the pits is necessary for comfort. Thanx for letting me sleeve rant, beyond that, excellent work and analysis on the shirt project, your client/friend is very lucky to have you in his life. This is definitely something I learned over the course of fitting the client. The original RTW shirt had a very flat sleeve cap, and the sleeve produced a lot of drag lines near the shoulder. By increasing the sleeve height, I smoothed out the wrinkles but caused all kinds of mobility issues. I think I ended up with a “happy medium” that at least satisfied the client. I can’t say I’m an expert at sleeve fitting, but I am WAY more comfortable with the process now than I once was.